Posted March 22, 2019 by Seán Kinane & filed under Environment, News and Public Affairs. A white-plague disease infected coral. By William F. Precht. “So, there’s no smoking gun that we have identified in terms of what the origin or the exact cause of this outbreak was. At the time, in 2014, there was a mass (coral) bleaching event that was just beginning at that time. And that would become a global event in 2014 and 2015 with the conditions there. So we did begin to see a lot of bleaching. 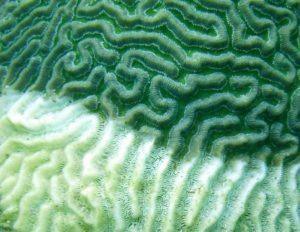 Corals in Florida, in general, are in a perpetual state of stress and have been for decades. There was also some extensive coastal construction activities that were going on at that time. The Port of Miami was performing its dredging to deepen its port for Panamax vessels. So there could have been a confluence of stressors that were occurring either because the water quality conditions, coastal construction activities, thermal stress that was occurring in the water. And it could be a confluence of all these different stresses that could have created the start of this event. And for people who might not be familiar, there are reefs in the Florida Reef Tract even beyond Key West. A guest on my show last year, coral disease researcher Greta Aeby, said that this is one of the most extensive coral disease outbreaks ever. How do you feel about that strong of a statement? “That is 100% accurate statement by Greta. For one of the reasons that I mentioned, we’ve never seen a disease outbreak affect this many species at one time. And, nearly half of the species in Florida have developed lesions and died with it. Another characteristic of this disease event that’s very unfortunate is how rapid the lesions occur. So when you have massive bleaching events and some other stressors that have affected corals, you can have survivorship or partial mortality on that individual coral when it’s exposed to the stressor and it either bleaches or it has disease. What we found with this disease event is that it is extremely lethal. “So the most susceptible species that succumb to this pathogen, they endure complete mortality. There’s very, very few survivors that get the disease and then recover from it. So that’s also made this extremely devastating. These corals you are talking about, these large ones that have been devastated, and the small ones that will take a while to recover, how old were those old coral colonies, the giant coral colonies that are dying? How long has it taken to build those up? And based on what you said, that’s not just a couple of years. That might be decades and decades. So, if I’m sitting here listening to my radio. I’m driving around the Tampa Bay area. I’m in Lakeland, or Brooksville, or Sarasota. I don’t have a coral reef outside my door. I don’t run a dive shop. 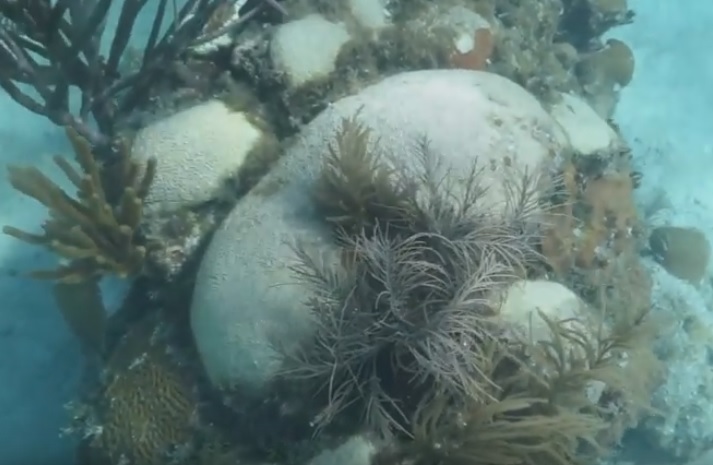 Why should I care, as someone living in the Tampa Bay area, that there are coral species, lots of coral species, that are possibly going locally extinct in the Florida Keys? I want to ask you about the cause of this [stony coral tissue loss disease]. Has the cause or the pathogen that causes it been determined? Thanks to Blannie Whelan for help with interview transcription. At the beginning of the show we talked about bills moving through the Florida Legislature and we heard from people commenting about Thursday’s show.